Roger Federer's Tennis Racquet - What Racquet Does He Actually Use? A lot of people wonder about Roger Federer’s Tennis Racquet and if you can buy in the stores. This post explains what tennis racquet Roger Federer uses. Is it what they say it is? Roger Federer’s tennis racquet is nothing magical, but his game style and results easily make you think it is. 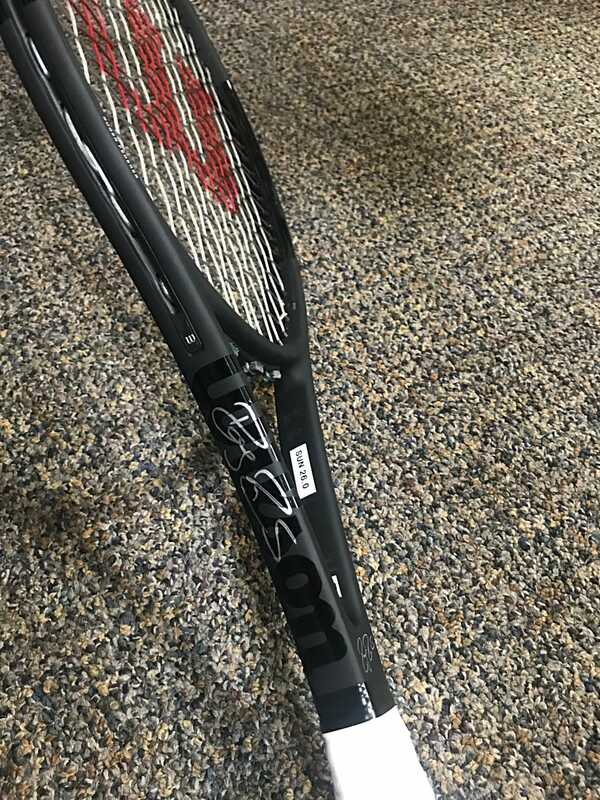 Federer uses his own Wilson Pro Staff RF 97 Autograph racquet that you can buy in the store. He uses Champions Choice strings. If you’re interested in what racquets other ATP pro’s actually use…read this post about pro player racquets. For many years Roger Federer played with the Wilson Pro Staff 90, a 90-inch racquet with a small but efficient sweet spot. Then after his slumping results and an injury-packed 2013, he decided it was time to make the move to bigger pastures and worked together with Wilson on a new, more powerful racquet, with a bigger beam and a larger racquet head. It became the Wilson Pro Staff Roger Federer Autograph 97 (racquet names ARE getting longer! ), abbreviated to the RF97A. Federer allegedly worked very closely with Wilson to create his specs and to offer them to the public, instead of using a paint job like Djokovic’s racquet and Murray’s PT630 (PT57A pro stock code) with a 16×19 string pattern for example. 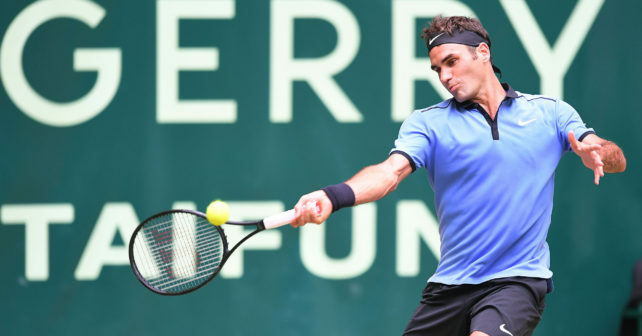 We still have the conspiracy theorists on the tennis forums claiming that what Federer plays with is completely different, but I really believe Federer plays with at least a very close version of the same stick that is being sold to the public. What could potentially be different is the stiffness rating as amateur retail racquets are often stiffer (pros can generate much more power with their swings), but it’s hard to be sure. According to Federer himself he was excited by the idea that offering the public the ability to use the same racquet as he is. Buy Roger Federer’s Gear here. Wilson even wrote the string specs (Wilson’s Champion’s Choice) on the frame, although they didn’t add whether there is any lead tape, string savers or power pads. My guess is that he still uses string savers and power pads and I know that racquet customization company P1 customizes his handle. The Wilson Pro Staff Federer Autograph is a racquet that requires a lot from the user, but when they bring the goods, the racquet can be a wonderful hit. Like with everything you need to be honest with yourself if your game benefits from the weight. I’m used to heavy racquets and found it close to magical at times, but after a few sessions I got some wrist pain that I think is either due to the wrong choice of string or the stiffness of the frame and that’s why I moved away from it the end. I do however suggest that accomplished players give it a serious spin, it’s definitely a racquet that can help your game if you’re eager to put the work and movement into it. Head Size: 97 sq. in. / 625.81 sq. cm. What are your thoughts around the Wilson Pro Staff 97 Roger Federer Autograph? Does it entice you? Please comment below! Has Federer’s new racquet helped him to number one? Do you know the model that Fed used when he used the 90 sq inch all of those years? It should have been the original Wilson Pro Staff 90 (black and yellow). He went from the Pro Staff 85 to that. In Hambourg 2013, before to play with the RF97A, he tried a 98 headsize racquet. Was it the wilson prostock h22 ? All secrecy around RF’s raquette that gives a touch of glamour. How reliable are the “Federer’s actual specs” you posted ? They’re measured from one of Federer’s match-used racquets so I would say they are as accurate as they can be. I’ve been testing the RF97A for 3 weeks and have slowly started getting used to it. My current rackets are the Head Graphene Radical Pro’s (and I had a quick dabble with the Pure Drive 2018 – bit too head light – but may return to it and put some tape in the hoop. The RF97A whilst noticeably heavier, is just rock solid for volleys, serves and return of serves. So solid, that it almost seems to favour ‘flatter’ blocking type shots. Where I am struggling though is generating topspin on groundstrokes with the RF97A. The heavier weight means I cannot seem to get that racket head speed to whip through and create aggressive plunging topsin shots forcing my opponents back. I’m going to set up the same strings (Tier One) and tension as the Heads so I can do I direct comparison. One trick with the RF97a is swap the leather grip for a synthetic and drop 10g, then use lighter strings. I used a 17g syn gut main, 18 poly cross and with overgrip got it to 338g. I have another that is at 345g with heavier strings, and another at 350g, all with slightly different weight strings. Somedays I go for the heavier one when I’m playing big hitters. When I do a clinic with mixed players on fast indoor courts with a lot of doubles, I like the lighter one. Everything is a tradeoff. Reducing the weight sounds like a good idea, I think it’s quite bulky otherwise. I agree that if I play more competitive matches, I play better with heavier racquets. And I very much agree that: “everything is a tradeoff”. Well put! A tennis racket is not different to a string instrument… saving differences. For example: if you play guitar to a certain level you can feel the difference among many factors. The better you play, like in tennis the most you can tell what works for you. The idea of starting low weight and customize is good but still a compromise nonetheless. I would suggest also that once you found certain balance that please your swing, try starting the same frame with a higher weight and achieve same balance. If this does not work, probably you are using a stiffer racket than what you need. Another issue to note, I played with rackets that were good for my game but gave me elbow pain after few days. So careful. I find that the dynamics of the frame/strings are extremely important, so keep that in mind. The more and better that you play, you want to achieve repeatable results as a goal. Did you look under the bumper? What are his power pads made of, there is no way you can get leather to be that thick unless you stack them, or you use black foam, which could be the right material because the people who string it reuse them as shown in footage of the Laver Cup. They are made of leather as far as I can tell. Have a bag at home if anyone’s interested. Hello, Dimitrov played similar rocket to Federer, I see now on French Open he has some different. Is Roger going to introduce new design as well? Dimitrov uses a relatively different racquet than Federer nowadays, the not commercially available Wilson Pro Staff 93S with 18×17 string pattern. But yes, he is using a new design at Roland Garros. And Wilson will release a new paint job for the Pro Staff RF97A for Wimbledon. I’m a bit curious about the ‘federer is just using a heavier batch’ postulate. Recently I bought a couple of the RF97 black version. They both came in at around 339 grams without anything added. I play with solinco tour bite 1.30 which weighs around 16-17 grams installed to the racquet. I add a wilson overgrip which weighs around 6-7 grams. All in all thats about 364-365 grams pr. racquet. Where is the difference then? I believe that the specs you got from the match used Fed-racquet is with everything installed. And the specs for the retail RF97 is without an overgrip and a dampener or powerpads. It is not much difference to be honest! The reason I wrote “heavier batch” is that with the Wilson QC you can get a quite different spec. I had three RF97A, one was 356 strung, one was 363 strung and one was 367 strung with a slight difference in balance points. But the listed specs are pretty much what Federer plays. A rarity of honesty in the racquet business! I really like your website. It is very informative and detailed. Do you know which string saver Federer uses? I have recently bought string saver of Babolat, but the colour is grey, whereas Federer uses white ones. Also, I watched a video where Ron Yu uses String savers for Federer, but there was no make on it. Thanks. I don’t know. Would guess it is Wilson. How did you get hold of one of his actual rackets? Sorry if this is a stupid one but do the power pads make a significant difference in the feel of the ball when contact is made? I’m curious as to why he uses the alu rough on the crosses when (in my head) surely it would generate more spin having them on the mains? Thanks! Sadly it was not one of the actual racquets, but I got one from the factory that was exactly his spec and then I added the same string setup and power pads to get the feel of the Federer stick. The power pads do not alter the feel a great deal, to be honest. They were made to avoid natural gut string wear of older racquets with sharp edges, but now that is not necessary. They might dampen the feel a bit, sort of like a dampener. Ah I see! Thank you. Would you say the string set up makes it one of the best set ups you’ve ever used? I’ve heard someone once describe the set up as the ‘rolls royce’ of tennis rackets/strings. I just can not think he uses such a stiff racquet (RA 68) . I think it’s impossible. The build quality of the racket and the flexibility of materials must be different. The “made in China” is not the problem, but the surgical precision of his shots would have been different with a rigid material. And the natural gut on mains would have produced too much power with the stiffness and the open string pattern. I know a guy who owns his actual racquet and has measured it on an RDC and it is actually the same specs as the retail racquets. Federer’s 90 sq inch racquet was also close to what was sold in the stores, so that is not so crazy. Federer’s customizers and stringers (P1) actually need to do some matching and tweaking since he doesn’t get “peRFect” frames from the factory. I have tried his setup, weight, balance, strings, tension and you can control the power with the kind of technique Fed has. what are the dots on the strings ? Weight or string straightners ? They are string savers to help the gut string last longer. They’re called string savers to help save the natural gut.